Able to handle everything from wood and steel to masonry and concrete, the Factory Reconditioned DEWALT DW511 1/2-Inch VSR Hammer drill is a versatile tool. Featuring a dependable 7.8 amp motor, variable-speed control, and a comfortable grip, this tool makes quick work of your drilling or fastening tasks. The DEWALT 1/2-Inch VSR Single-Speed Hammer Drill's durable and powerful 7.8 amp motor is capable of delivering a maximum of 650 watts. Also, it offers overload protection and a variable-speed trigger for precise hole placement and material-appropriate performance. Built to make quick work of light-duty concrete and masonry applications, this tool's hammer mode allows it to bore through tough materials without damaging or burning the bit. The hammer drill's works in concrete, wood, and steel. 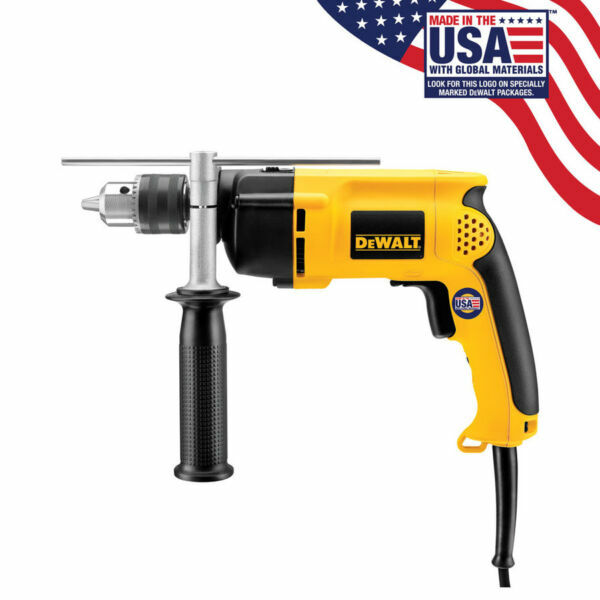 It offers a 1/2-inch drilling capacity when working with steel, and a 1-1/4-inch capacity when working with wood, and a 5/32- to 3/8-inch capacity when working with concrete. A two-finger rubber trigger makes speed control easy, while a 360-degree side handle offers hand-position options for optimum handling. An integrated depth rod provides top-down accuracy. The hammer drill measures 11-1/2-inches long and weighs an easy-to-manage 4.3 pounds. •Capacity In Steel 1/2 in. •Capacity In Wood 1-1/4 in. Includes one year Dewalt Factory Reconditioned warranty. For complete warranty details visit the manufacturer website at dewalt.com.